The home page for the LCMC is at http://www.lancs.ac.uk/fass/projects/corpus/LCMC/. Of the two links on the page for the distribution locations, the Oxford Text Archive link is the only one that allows for direct downloading. Follow the link to the Oxford Text Archive, browse the archives, and search for Lancaster Corpus of Mandarin Chinese in the “Corpora” tab. The LCMC is ID 2474. The download link is directly on the detail page. After reading the Terms and Conditions, enter your email to receive the link to the actual download location. Clicking on the link in the email message will immediately download the file, 2474.zip (6.5MB). The scripts can be downloaded as a zip file from here, or as individual files in the archive. You will need Perl installed on your machine, along with a few necessary modules that may need to be downloaded separately. Full information on the required steps can be found in the README file. If the data conversion was successful, you will now have a 297 MB file called lcmc.db3 in the current directory. 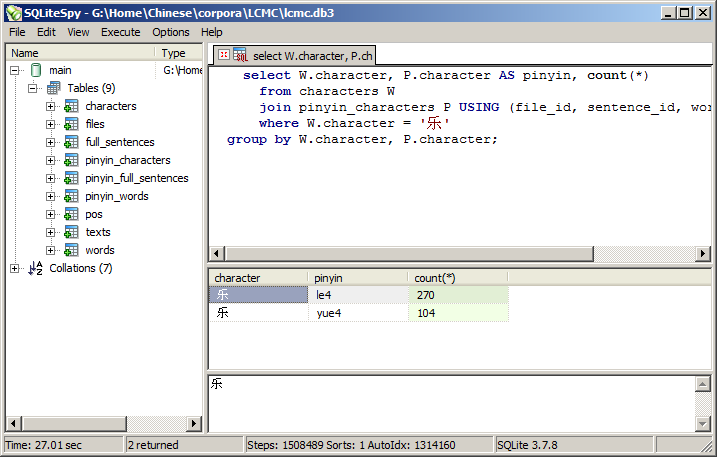 As for client access to the newly created SQLite database, you will need software that can handle Unicode, so that the Chinese characters can be displayed. For Windows, SQLiteSpy is my personal choice. Queries are fast, the interface is intuitive, and it has Unicode and support for regular expressions built in. For Linux, both Sqliteman and SQLite Manager (a Firefox plug-in) are adequate. One common software package for Linux, SQLite Database Browser is not suitable, because the LCMC database is large, and the program works by trying to load it all into memory at once. 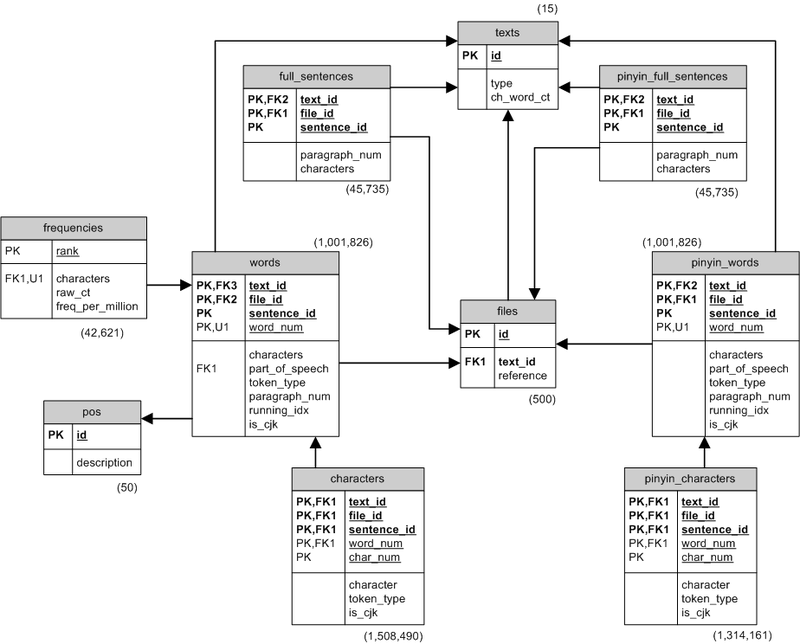 In a relational database, information is organized into separate tables of data and linked by unique keys for each record. 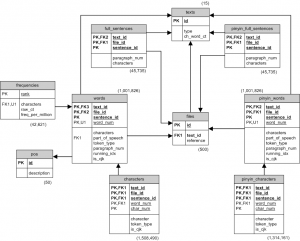 This arrangement makes it efficient to perform many kinds of queries. Below are just a few examples of the kind of reports that be done. 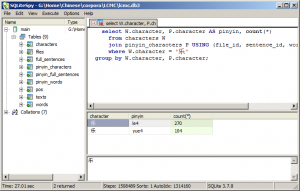 These are just a few examples of what you can do with the corpus data in the SQL database. Have fun!